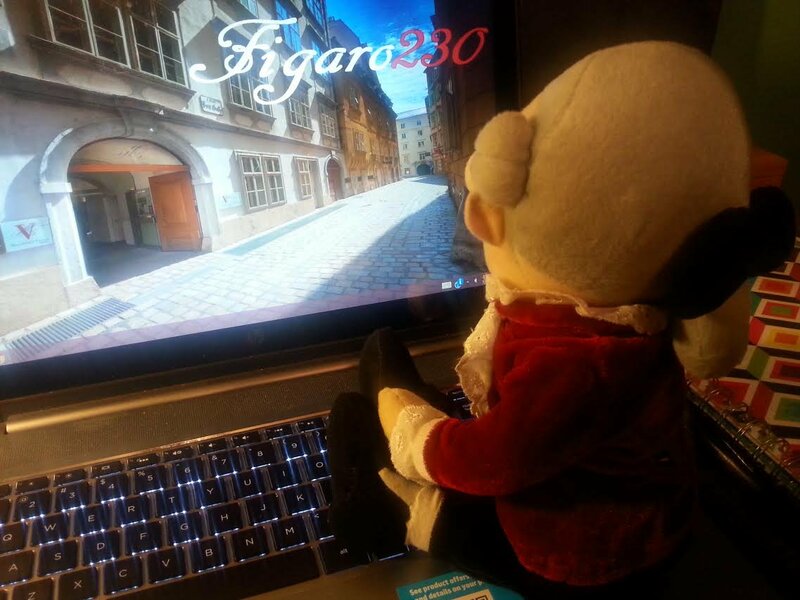 To celebrate the 230th anniversary year of Mozart's opera Le nozze di Figaro, I created the Figaro230 initiative to collect and display celebratory regards from Mozart's fans all over the world at the Mozarthaus Vienna. The Mozarthaus, now a museum, was Mozart's largest and most opulent apartment. Although he had several addresses in Vienna, Mozart lived at Domgasse 5 longer than he did at any other residence, and it's the only one that survives today. Mozart composed Figaro in 1786 while living there, a time period (1784-1787) representing some of his most productive, popular and prosperous years in the city. By the August 14th deadline, I received submissions from Mozartians in the UK, Italy, France, Brazil and the USA. The project elicited creativity capturing an admirer's own talents to express his or her personal appreciation and sentiment for the opera. Figaro often has a special place in the hearts of Mozart's fans as a catalyst for their admiration, and it was certainly evident in the project outcome! 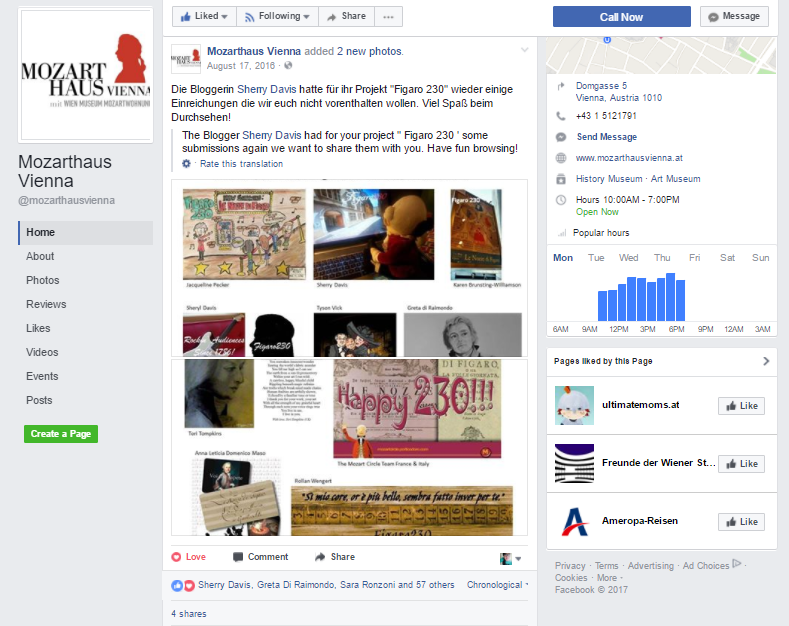 Today, the Mozarthaus published Figaro230 submissions on their Facebook page. The Figaro230 collection will be displayed on screens at the entrance of the Mozarthaus museum and at the box office on October 13th and 14th, 2016. In addition to inspiring Mozart's fans as they walk through the historic residence, the collection will provide a pictorial narrative on contemporary Mozart fandom as it coincides with a symposium the Mozarthaus is hosting about Mozart's reception in our world today, entitled Mozart heute: Zum aktuellen Stand der Mozart-Rezeption (Mozart Today: The Current Status of Mozart Reception). There's no better way to demonstrate how beloved and popular Mozart remains in 2016 than by displaying creative expressions from devoted and appreciative admirers! Figaro230 not only celebrates the opera's anniversary. It also recognizes a shared decennial anniversary. In 2006, after a full restoration, the Mozarthaus opened its doors. That same year, my own journey began with The Chronicles of a Modern-Day Mozartian. I'm thrilled to be working with the Mozarthaus team again following the success of our Mozart birthday greeting exhibition in January 2015. I'm grateful for their support of my ideas to engage Mozart's fans and give them the opportunity to connect with the composer and other individuals who share their passion in such a unique and unprecedented way.